백자 반합(白磁 飯盒)은 조선시대 만들어진 총 높이 22.5㎝, 뚜껑 높이 9.9㎝, 뚜껑 지름 17.4㎝, 아가리 지름 15.3㎝, 굽지름 9.4㎝인 조선시대 백자반합이다. 뚜껑의 윗면 가운데에 꽃봉오리 모양의 꼭지가 달려 있고, 그 위로 두 줄의 음각선이 돌려져 있다. 뚜껑의 가장자리는 굴곡을 이루어 아래 몸체와 잘 맞도록 되어 있다. 아가리 부분은 오므라지고 두툼하게 단을 이루며 서서히 벌어져서, 몸체 아랫부분에서는 풍만하다. 밖으로 벌어진 다소 높은 굽다리와 어울려 기품 있고 수려한 멋을 풍긴다. 유약은 담청이 감도는 백자유로 두껍게 전면을 칠했으며 은은한 광택이 흐른다. 뻗쳐 나오는 힘과 격식을 갖춘 엄정한 분위기를 단정한 형태와 풍만한 양감으로 잘 나타내고 있다. 담청색을 머금은 맑은 백색을 띄고 있는 이 반합은 전체적으로 조선 초기의 시대적 배경이 잘 표현되어 있으며, 조선시대 대표적인 반합 중의 하나이다. 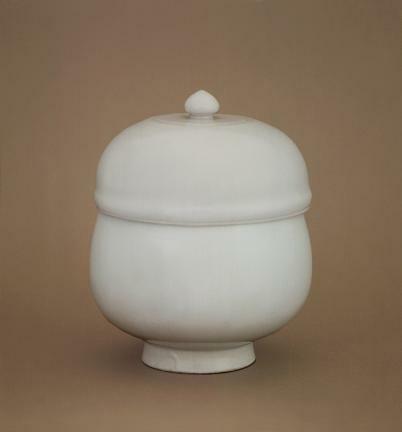 This is a white porcelain canteen from the Joseon Dynasty. It is 22.5 cm in total height while its upper diameter is 15.3 cm and the diameter of the heel is 9.4 cm. The lid is 9.9 cm high and 17.4 cm in its diameter. There is a small knob resembling a flower bud at the center of the upper side of the lid with a pair of lines engraved around it. The verge of the lid was made indented to fit well with the body of the bowl. With a puckered mouth, the body gradually broadens as it goes down and becomes plump in the lower area. It matches perfectly with its heels, which are slightly tall and spread outward, to give an elegant and graceful look. The entire surface is coated with a thick layer of light-bluish white enamel, which gives a dim gloss. Exploding energy as well as a mood of strict formality is well reflected in the upright shape and capacious volume of the bowl. Made in clear white with a light blue tone, this canteen well reflects the overall mood of the early Joseon Dynasty. It is certainly one of the best canteens from this period.